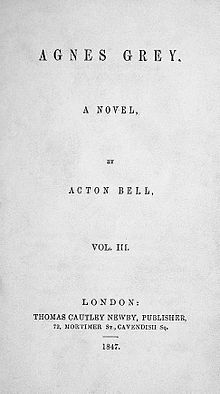 Agnes Grey is a novel written by the English author Anne Brontë and first published in 1847. The novel is about a governess of that name and is said to be based on Anne Brontë's own experiences. It was her first novel. Story has happy end. Finally, Agnes married her heart friend Edward Weston and they have three children called Agnes, Mary and Edward. Agnes Grey – the daughter of a minister who decided become a governess to support herself and her family. Mary Grey - the elder sister of Agnes. Richard Grey - the father of Agnes and Mary. Mrs. Grey - the mother of Agnes and Mary. Squire's daughter and a woman of spirit. She married Richard despite of the wishes of her friends and family. Mr. Weston – the curate at the local church. Mr. and Mrs. Bloomfield - Agnes's first employers. Uncle Robson - the brother of Mrs. Bloomfield. Tom Bloomfield – the Bloomfield's couple son, well-grown seven years old boy. Very violent to animals. Mary Ann Bloomfield – the eldest daughter of Bloomfields. Fanny Bloomfield - the second daughter of Bloomfields. Mr. and Mrs. Murray - the second employers of Agnes. Mathilda Murray – the second daughter of the Murrays. Mr. Hatfield – the rector at the local church. He loves Miss Murray but she doesn't answer his feeling. This page was last changed on 11 August 2018, at 18:26.